All-round windsurfing at its best. Sandy beach, port tack side-shore wind, safe entry and exit. Conditions at Vela Baja are perfect for windsurfing. You’ll find an uncrowded sandy beach that stretches for several miles in each direction. Typically the wind is side-shore, port tack (from left to right). Early morning breezes are often light favouring beginners and improvers. Then later on due to a local thermal effect the “El Norte” wind increases resulting in stronger winds with a typical day ranging 18 to 23 knots. Seas build to a decent size rolling swell giving the spot its famous “bump and jump” conditions. Even on days when shore-break increases, there are safe entry and exit points just a few metres upwind and downwind of Vela Baja. Your safety is our primary concern and we provide a constant safety watch and rescue service for our windsurfing customers. There are no strong tides or currents. There are no submerged hazards. The shape of the bay and wind direction enable easy self rescue. The majority of the beach is wide, sandy and free of obstacles. The beach is far from roads and traffic. At certain times small stretches of beach may be subject to heavier shore break and small rocks near the shore. These can easily be avoided with a little local knowledge. The Vela team will coach you on the spot before you head out for the first time. 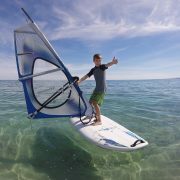 You can rent from our extensive range of boards and sails from major windsurf brands JP, Goya, Starboard and NeilPryde. 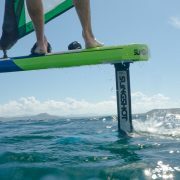 No matter the wind conditions, your level or preferred windsurfing style there is equipment to suit your needs. 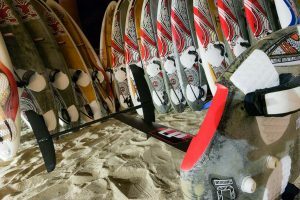 Boards include wave and freestyle editions as well as larger freeride and freerace types. There are also several windfoils now available in the fleet. Standard sails range from 3.7m² to 7.7m² and come fully rigged ready to plug and play. For younger or lighter riders we also have purpose designed “Dragon Fly” rigs. Optional insurance is available for $20 US per week. Insurance covers up to $100 accidental damage. Insurance does not cover damage or loss due to negligence or abuse of equipment. Available at extra rental cost. Interested in learning or improving? Then consider taking one of our lesson programs. There are courses for complete beginners as well as intermediate and advanced windsurfers wishing to progress. 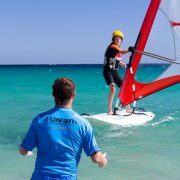 To ensure your maximum progress (and safety) we generally adopt an effective “one-on-one” approach to windsurf lessons. Furthermore, although each course has an outline structure, you’ll find our instructors tailor each and every lesson to fit your exact needs. Please also note that windsurfing lessons will typically include some theory, as well as on-water time. Lessons packages start at 1hr and are discounted for longer courses. All the equipment you will need is provided. If you have never windsurfed before and are keen to give it a try then this 1.5hr one-on-one lesson is for you. First you’ll learn the basic principles from our patient, experienced instructors on a dry land simulator and then put theory into practice on the sea. Our purpose designed equipment is especially suited to newcomers and our instructors will be there to guide and encourage you throughout the lesson. All equipment required is included in the price. Includes additional 2hrs equipment rental. This 3 day course is perfect for either total novices or those with some limited prior experience who really wish to master the basics and make rapid progress to intermediate level and beyond. Included in the price is a total of 3.5 hours of instructor time and unlimited use of purpose designed beginner equipment over a 3 day period (does not have to be consecutive days). Whether you are an novice ready to progress to intermediate level or an advanced rider wanting to refine your existing skills then consider taking an hour of dedicated and focussed instruction with one of our highly experienced instructors. Without doubt it’s the best way to short cut the learning process and make rapid progress. Lesson price is per hour and includes equipment rental for duration of the lesson. 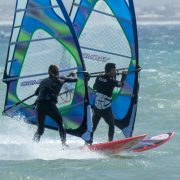 This “one-on-one” course provides all the basic knowledge – with a focus on safety – for proficient windsurfers wishing to try hydrofoil wind surfing. Lesson duration is approx. 90min and includes 1 hour of on water practice.